Blog: p2P LIVE Southpaw, Year 4 Welcome to the Color Pop Crop! We are so glad you have decided to join us for our first quarterly crop of the year. We have created this interactive agenda so that you only have one post to keep track of with handy links to all of our crop offerings. We have a fast, functional and fun set of offerings for you over the next three days. We know you will enjoy each and every one. 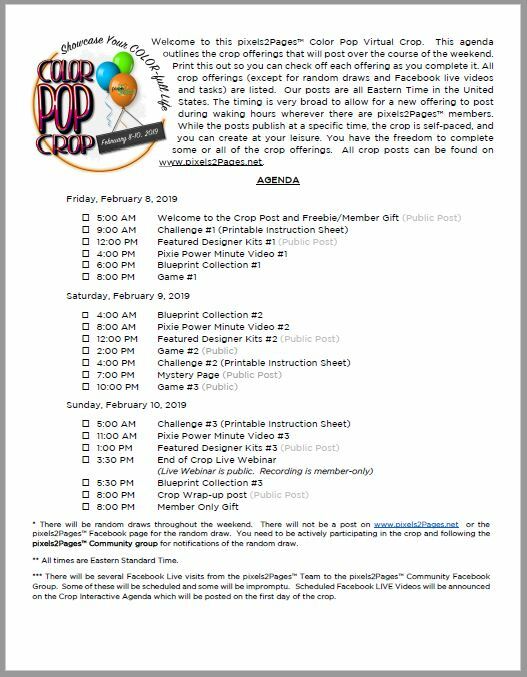 Click the image below to download a printable version of the agenda or the crop prep checklist. Note: The links to the crop offerings will not work until (and after) their scheduled times. Exception: you may register for the End of Crop Webinar at any time. Non-members may register to attend the live recording of this webinar. The recording is reserved for pixels2Pages members only. Our website will utilize a caching system so that pages will load faster during the high traffic times of this crop. What that means is that our Recent Posts page may not update with the crop posts immediately upon publication. It may take up to 30 minutes for a crop post to show up on our Recent Post page; however, you can access those same posts immediately upon publication by using the direct links on this agenda or links that we post on Facebook. Posts are member-only unless otherwise indicated. All times listed are Eastern Daylight Time (US). This crop is self-paced. You decide whether you complete some or all of the offerings. We do not expect you to get up at 6:00 am to check a crop post! All crop posts will remain available for the duration of the crop, and if you are a p2P member, you can go back and look at them at any time! Post times vary because we have members all around the world. Our goal is to have new posts publishing during waking hours world-wide. Just remember that you can work on them any time after they have been published! Click on the links listed below to be taken directly to each crop offering. You need to be a pixels2Pages member on or before February 15, 2019 in order to gain access to member only gifts and Blueprint posts. What is a Virtual Crop? It is similar to an in-person scrapbooking event, but done in the comfort of your own home and/or with friends and at your own pace. The pixels2Pages™ team will provide a fun combination of videos, challenges/bright ideas, games, Blueprints, and digital art recommendations. You create pages using these offerings, learn something new, and make progress on completing a project that you can print at the FOREVER Store. Do I have to register? No. Registration is NOT required. You just show up and have fun! A pixels2Pages™ membership is required to access most of the offerings. What should I do to prepare for the crop? Organize your photos and have groups of photos selected for each offering. Think in terms of one crop offering equals one or two pages, then set a goal for how many pages you’d like to complete. The readier you are, the more you’ll get done! Where will I find the crop offerings? All offerings will be posted on www.pixels2Pages.net. You can access all of the offerings in the order they have posted by clicking “CROP” or“RECENT” on the mango website navigation bar, or by clicking the agenda links above. Your best option is to use this agenda since the caching system we will be using to speed up the site may cause a delay in posts appearing in the “CROP” or “RECENT” categories. If you are a Facebook user, we will post shout-outs for each offering on the pixels2Pages Facebook Page. We will not post any other items on our page during the crop so that the most recent offering will always be at the top of the page, just below the agenda. Most of our crop activity will take place in the pixels2Pages Community Facebook Group. That is where you and other croppers will post your completed pages. We invite you to see what others have posted and comment on them if you want. That’s a great way to get inspired and motivated if you get stuck, and it’s fun to do when you need a break! How can I share my pages? 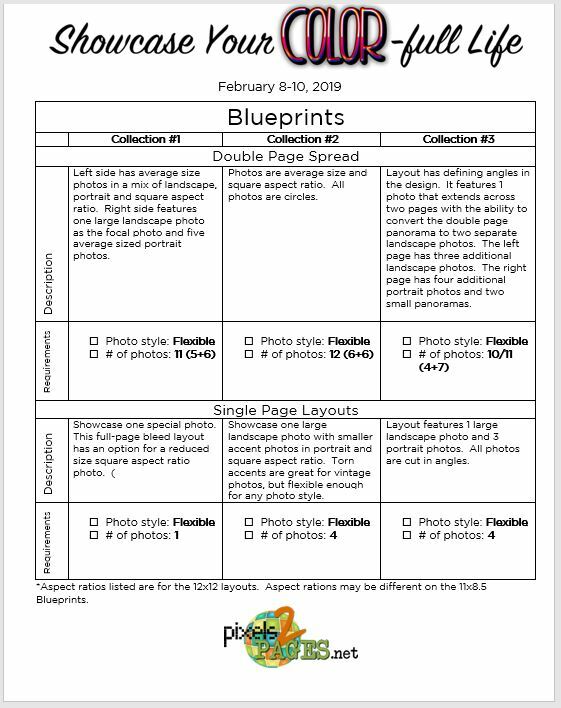 We ask that you share your completed pages in the pixels2Pages™ Community Facebook Group. Your page must use a pixels2Pages™ offering and feature only content purchased in the FOREVER Store. Retired content and content now owned by FOREVER under the StoryBook Legacy™ brand are welcome. We ask that you credit the offerings and digital art you used in the caption of your post. How do I share my pages if I don’t have Facebook? The pixels2Pages™ Team will create a FOREVER Collaborative Album where you can upload your completed pages. While most of our games and drawings require you to participate in the crop in the pixels2Pages Community Facebook Group, you will have an opportunity to win prizes by adding your pages to the Collaborative Album if you are not a Facebook user. To use a collaborative album, you will need to have a FOREVER Storage Account or a free intro account. You will first upload your layout to your FOREVER Storage or intro account and add the appropriate credits to the description of your image. You can then add your image into our collaborative album directly from your library. Alternatively, use THIS TIP to add credits to your pages first, then upload them directly to the collaborative album. Do you have any offerings that explain virtual crops in depth? Maximize Your Membership with pixels2Pages™ Crops: This webinar gives you an overview of what we do during our crops and how crops operate. Some details have changed, but you’ll get a good idea how things work. Navigating the pixels2Pages™ Community: This webinar shows you how to use Facebook to its fullest. Control your group notifications, save links to your favorite pages, and more with the informative webinar. How long do we have to earn our badges? I am giving up on my internet and will try the library on Tuesday. You have until the 15th of February. Missed the live video as I am in Australia. How can I watch it now? The system seems different than last time. Our live end-of crop video is tomorrow at 3:30pm Eastern time. I wasn’t able to view the live webinar today. How do I access it now? Thanks for all you do. PS My son in SLO is now cancer free. Yeah! Desa, That is GREAT news! Thank you so much for sharing with me! I really have enjoyed working with you on customer care! How do I get badges ive earned? Love the virtual agenda! Trying to find the badge with the Color Pop Crop logo without the “cropping with my friends” banner. Here is the link to the badge albums. Scroll down and it will be the first badge listed. Got figured out – thanks for your help! I love the interactive agenda. I can have it open in one tab and just pop the newest item in a new tab. Very helpful. Try logging in again… it should work now. I’ve tried to participate in this Virtual Crop since 9 am MST and ordered the Blueprints but have not been able to download the free digital art kit or to see any of the challenges. I don’t know what I’m doing wrong but I keep getting error 404. I see you have a membership. I am going to email you information for logging in.